The Williams Center was opened in 1972. In the past 46 years, The Williams Center has literally trained over 41,000 students. We have celebrated 46 Annual Dance Recitals. We have sent over 1,908 Team Gymnasts to the Arkansas State USAG Competitions. We have had numerous USAG State and Individual Apparatus Champions. We have had 219 gymnasts qualify to the USAG Level 7-10 Regional Competitions and have had 20 gymnasts qualify to and place at Level 9 and 10 Nationals as well. We have had seven athletes receive NCAA Gymnastics Scholarships. We are very proud of our teams’ reputation! 41,000 In the past 46 years the Williams Center has trained thousands of Dance and Gymnastics students! With Fayetteville as her hometown, Donna has been with the Williams Center from the very beginning. Along with her mother and sisters, Donna helped open the Williams Center as a family owned and operated business 45 years ago. She received her BS in Physical Education and Health from the University of Arkansas where she was also a freshman Razorback cheerleader. Donna was a member of the Arkansas Gymnastics Team where she received one of the first ten scholarships given to women’s athletics at the University of Arkansas in Fayetteville. After college Donna taught Health and Gymnastics at Springdale High School along with Gymnastics at Central and Southwest Jr. Highs. She also coached Woodland Jr. High and Fayetteville High Schools’ gymnastics teams. She was the Arkansas USAG State Chairman for 10 years and has served on the Arkansas USAG Board for 25 years. She has been judging women’s gymnastics for 33 years and has held an Elite/National rating for over 26 years. Donna has served as judge for the Big 12 and SEC Conferences; as well as NCAA Regional and National Competitions. She is a professional USAG Member; USAG Safety Certified; USAG Skill Evaluator; Member of NAWGJ; Member of Arkansas USAG State Board. Jim’s hometown is Fayetteville. He was raised in College Station, Texas; San Jacinto, California; and lived in Nigeria, Africa. Jim received his BS and MS in Aquatics Ecology from the University of Arkansas in Fayetteville where he competed for the UofA’s track team. After college he worked for Texas A&M as a dive master on the Gulf and was a certified NAUI scuba instructor. He was also a dive master for the US Fish and Wildlife in Arkansas. Jim has been instructing children of all ages for over thirty-seven years. He has been co-owner and operator of the Williams Center in Fayetteville for over Thirty-two. 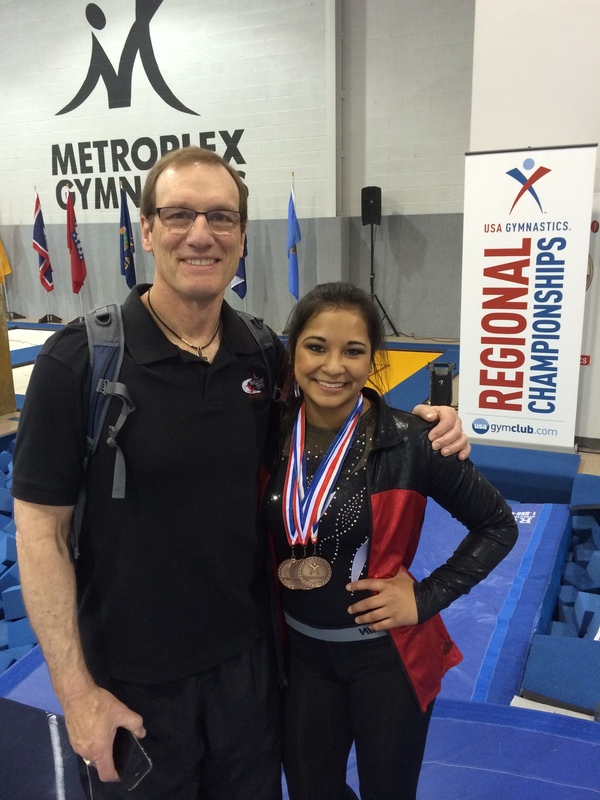 In addition to coaching the Williams Center Team gymnasts, Jim coached the Fayetteville Lady Bulldog Gymnastics team for eight undefeated seasons. Jim is a professional USAG Member; USAG Safety Certified; and a USAG Skill Evaluator. He also holds a Whitewater Rescue Certification. Jim coaches vault and bars for the Center’s level 3-10 Teams.